NAPPANEE, IN. 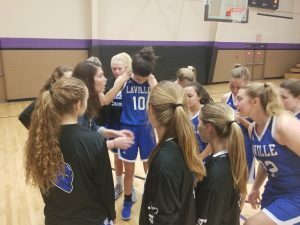 – LaVille Lady Hoops will hit the road Monday, December 3 to face an opponent they haven’t faced since the 1980s. The Lancers take on Class 3A #15 NorthWood at The Panther Pit. The JV game is set to tip at 6:15 p.m.
LaVille is coming off a 38-22 Hoosier North Athletic Conference loss to Triton. Julia Hall led the Lancers with 11 points. Hall also added six rebounds, three steals, and a blocked shot. Junior Maddie Payne and Kate Rulli led NorthWood in a 44-42 loss to Northern Lakes Conference. Payne scored 13 points while Rulli added 12. Alea Minnich led the rebounding effort with seven, while Payne added six boards. “Well we’ve had two really good practices in a row,” said LaVille coach Corey Duncan. “I’m hoping to see two things win or loss on the scoreboard: 1) decreased turnovers and 2) when we come off the floor we know that we gave everything we had to win the ball game. LaVille and NorthWood have not played in recent history. In going back through archives, it appears the last meeting between the Lancers and the Panthers came in the 1985-86 season. NorthWood won a 41-36 battle in a game coached by LaVille coach John Willoughby and NorthWood Hall of Fame Coach Steve Neff. Coaches: Corey Duncan (37-41 in fourth year at LaVille). Adam Yoder (70-40 in fifth year at NorthWood). Last Outing: LaVille lost 38-22 to Triton. NorthWood lost 44-42 to Concord.